Gil Faizon (Nick Kroll) and George St. Geegland (John Mulaney) have lived lives far more charmed than their fictional biographies let on. The bespectacled working actor/stand-in model for mashed potatoes and his best friend—a writer whose personal history has significant overlap with those of accused murderers Michael Peterson and Robert Durst—have come far from their origins as Upper West Side caricatures hosting a comedy night in the East Village. They became breakout characters on Kroll’s eponymous Comedy Central sketch show, after which he and Mulaney mounted off-Broadway, touring, and Broadway runs of Oh, Hello, a stage show that inhales deeply from George and Gil’s mountainous reserves of self-aggrandizement, abnormally pointed malice, and penchant for idiosyncratic pronunciation. Or, as they’d probably put it, a “pin-chint” for “idd-yo-syncretic” pronunciation. 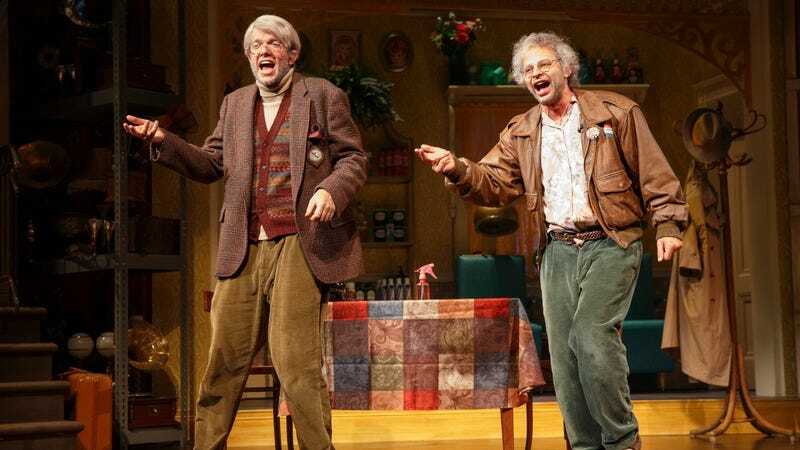 Across live performances, taped sketches, numerous podcast and talk show appearances, and an in-character New York Times profile they’d brag about loudly enough so everyone in the diner can hear, Kroll and Mulaney have turned the tuna-crusted, Steely Dan-loving equivalents of Statler and Waldorf into darlings of the comedy world. Next stop: A Netflix special recorded during Oh, Hello’s stand at New York’s Lyceum Theater. Besides, George and Gil need no help with alienation. The most remarkable aspect of the duo’s climb to semi-renown is how unrelentingly awful they are, to one another and everyone else in the world. Kroll has described them as “monsters,” and their behavior throughout Oh, Hello is plenty monstrous: They holler at an unseen tech intern, ignore one another’s cries for help, and express an omnidirectional chauvinism that would be empty provocation in clumsier hands. Gil and George’s cruelty and stupidity don’t always have a point, but they do always have a basis in character—characters that Kroll and Mulaney have been honing for more than a decade, filling in their outlines with the codependence and vulnerability they fail to mask with verbal abuse and faux bravado. Take them out of their comedic context, and Gil and George could star in the sort of high-tension stage dramas Oh, Hello parodies during its loudest moments. Oh, Hello is more than just Gil and George’s basest instincts—it’s also their professional jealousies, their selective memories, their wont for foisting massive deli sandwiches on “unsuspecting” guests. It’s all informed by the stars’ affection for and knowledge of odd cultural corners, like the true-crime obsession that often comes out in Mulaney’s stand-up, or the rat-a-tat Theater 101 class that wends its way through Oh, Hello’s introductory portions. On a set they claim to have cobbled together with cast-offs from a Steel Magnolias revival, an unnamed August Wilson play, and The Cosby Show, Gil and George run through the classics of dramaturgy: The one-sided phone call, yelling, and light-dimming exit lines of “mild significance.” (“You know, looking back, my father was a poor man. But in the end, he gave us the greatest gift of all: a 1997 Toyota Tercel.”) Addressing the Lyceum, the characters identify the Venn diagram of at-home audiences that will keep Oh, Hello On Broadway in heavy rotation: “A collection of comedy nerds, theater dorks, and children whose parents have made a severe miscalculation.” The special will enjoy an unlimited engagement in the corners of high-school drama-club parties where no one is making out, playing to an audience of the tech crew and the four cast members who lobby to do Spamalot every fall. They’ll love it, and they should. The call for Netflix’s Oh, Hello On Broadway is self-evident: Gil and George’s frame of reference might not extend beyond the five boroughs, but their fanbase does. And even then, the touring version of the show would’ve left some supporters in the lurch. The challenge then becomes translating a work that’s so tied to the customs and the immediacy of the theater; the camera is mostly there to show the audience what they couldn’t see from the cheap seats. Extreme close-ups punctuate moments of friction between George and Gil, while reverse angles let us in on their frequent upstage huddles. (One joke about bad sight lines is kept intact by a shot taken from the obstructed-view seats.) Otherwise, director Warren stays out of the actors’ way. When the onstage action switches to Gil and George’s public-access prank show, Too Much Tuna, the characters are briefly framed head-on like typical chat-show hosts, but the compositions regain their wide-angle view of the Lyceum soon enough. There’s also a better look at the theatrical finery these grumpy old schmucks acquired on their path to the Great White Way. The junk-shop set is a visual gag in itself, more evidence of Oh, Hello’s comedic meticulousness. And getting up close and personal with the guys emphasizes just how ugly George and Gil are, inside and out. The baggy corduroys, the liver-spotted hands, the unkempt hair—it’s all several shades more realistic than the wigs and drugstore reading glasses that transformed Kroll and Mulaney into Faizon and St. Geegland during the Kroll Show days. Major props are due to makeup artist Annamarie Tendler Mulaney, who night after night made two handsome guys in their thirties look like flaky-skinned gray-beards who subsist solely on canned tuna and regret. That attention to detail is in the performance as well. Kroll, more the actor of the pair, finds Gil in bad posture, grimaces, and the hilarious habit of celebrating small victories by impotently shaking his fists in the air. Mulaney, the more seasoned stand-up, does George through voice and delivery, never funnier than when he’s reciting the stage directions from his alter ego’s awful, awful play. The characters are at their best when the actors are in free-association mode, and Oh, Hello On Broadway captures some of that: a Mulaney vamp on a Pacino-like reaction that has Kroll bent over with laughter, or Kroll getting a touch too familiar with the space between Mulaney’s pinky nail and his nailbed. The Too Much Tuna segment is seemingly designed to harness this improvisational energy mid-performance, and it certainly does in Oh, Hello On Broadway, as the conversation with their big-time celebrity guest allows Kroll and Mulaney to indulge their distinct areas of expertise while trading barbs with a bona fide comedic legend. The constraints of a script give definition to the relationship between George and Gil, in which the former is the screaming-mad alpha dog and the latter is the Looney Tunes terrier merrily hopping around his orbit. Lacking self-awareness at every level, neither will admit to how badly he needs the other, and that gives Oh, Hello its dramatic arc. But narrative is just gravy for Oh, Hello—and boy, is that ever apparent as the play-within-the-play slams through meteoric rises, catastrophic falls, and implied man-on-raccoon romance. (But hey: It’s supposed to be a bad play.) The show isn’t about story; it’s about displaying the connection between these two performers, who long ago struck up an inimitable dynamic, and have followed that dynamic to increasingly rewarding heights. 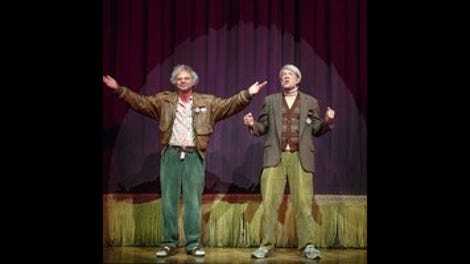 No one else in this world could, or should, come up with characters like Gil Faizon and George St. Geegland. Oh, Hello was the ultimate expression of those personas, and a singularly funny testament to Kroll and Mulaney’s creative partnership and personal friendship. And thanks to Oh, Hello On Broadway, the show lives on to amuse and mystify a whole new audience.